St Teresa of Calcutta (1910-1997) was born in Skopje, the Republic of Macedonia, to Albanian parents. At eight, her father died and she was raised by her mother, a Roman Catholic. At 18 she joined the Sisters of Loreto. In 1929, she went to Loreto Convent School in Eastern Calcutta as a teacher and novitiate. She took her solemn vows in 1937 and served as teacher and Headmistress for almost 20 yrs. In 1948, deeply affected by the poverty and famine surrounding her, Saint Teresa embarked on a new mission. She adopted the now famous white habit with blue border, received basic medical training and started a new school among the destitute and starving. Soon she was joined by other women helpers which in turn led to the formation of the Missionaries of Charity. The Orders purpose was to help, “The poorest among the poor – the hungry, the naked, the homeless, the crippled, the blind, the lepers, all who felt unwanted, unloved, uncared for, people that had become a burden to society and were shunned by everyone”. Saint Teresa of Calcutta received numerous awards during her lifetime; including the prestigious Nobel Peace Prize in 1979. She is the Patron of World Youth Day. Her Fesast Day is the 5th of September. Request: Ask for the grace of an intimate knowledge of Jesus. 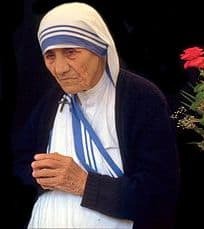 Prayer: Saint Teresa of Calcutta, you allowed the thirsting love of Jesus on the Cross to become a living flame within you, and so became the light of His love to all. Obtain from the Heart of Jesus… (This my request). Saint Teresa of Calcutta, teach me to allow Jesus to penetrate and possess my whole being so completely that my life, too, may radiate His light and love to others. Request: Ask for the grace to be convinced of Jesus’ unconditional and personal love for you. Request: Ask for the grace to understand Jesus’ cry of thirst. Request: Ask for the grace to learn from Our Lady to quench Jesus’ thirst as she did. Request: Ask for the grace to have an unshakable trust in the God’s power and love for you and for all. Request: Ask for the grace to surrender your whole life to God. Request: Ask for the grace to find joy in loving and to share this joy with all you meet. Request: Ask for the grace of a deep faith to see Jesus in the Bread of Life and to serve Him in the distressing disguise of the poor. Request: Ask for the grace to become a Saint.